I wondered whether to post this outfit as its just a simple errands running, casual outfit. It got me wondering, do i only post the outfits that i feel will get the most hits/comments/nods of approval? Natural thought progression then went down that whole road of self wondering, why do i blog, am i staying true to myself, who do i blog for etc etc. Any blogger who has been doing this a while gets to theses questions every once in a while (i think?). Right now there is so so much change happening in my life i’m starting to question everything. We are currently in a huge transitional period. A fresh start for me and my family is just around the corner and i am embracing the mind set of out with all things negative, false and unnecessary and onwards and upwards with all things positive and good. That doesn’t mean i’m through with blogging, heck no! I absolutely love this wonderful community and all you lovely ladies. It just means that going forth i am going to use this little web space as a diary, a style diary yes, but it will hopefully document casual days, fancy-pants days and everything in-between. Reading back through the past years posts it made me realise this really is a little on-line diary (that i share with just a few people,lol!) and that through my outfits and small writings it has done well as a documented reminder of how i was doing at that specific point in time, a time i will never get back but it sure is good to look back on and see how far/what direction i have gone in. Sometimes i get so consumed with blogging a certain type of outfit that is in my mind (normally pretty dresses with lovely shoes) that i don’t end up posting other outfits like this one. I love my dresses and shoes and skirts etc but sometimes practicality (especially right now) overrules. This outfits not ground-breaking,it ‘aint nothing special but i love it! Its comfy cosy casualness is just what i need with lots of packing up boxes for moving, running around after my monkey of a son (we’re potty trainin eeek), school runs and shopping. I will miss the views at each end of my street when we move, but i am soooo looking forward to a more central location that is a lot easier to get to work/school/step kiddos. Do you have a favourite casual outfit ? Do you blog about it? You are just the cutest, dear! I really need to get in the habit of taking pics of my every day work outfits and not just waiting for the weekends when I'm wearing my thrifty stuff. I think readers like to see the every day normal stuff to because sometimes we relate more to those. I need to start scouring ebay for some Minnetonka's!! 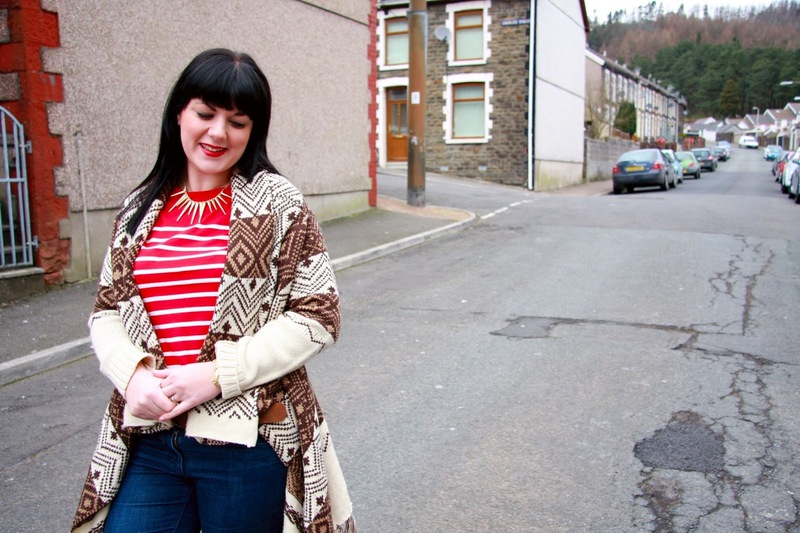 I love this cardigan! It looks perfect for a chilly day, or evening at the lake. You make even casual look good Lady! Love seeing your dressy posts, but these are fab too! Oh oh oh! Super cute! The Aztec + Red + Mustard. I love this! And we are so happy to have you on Falling For Friday!!! I love this sweater with that shirt, very creative! Gosh, I think about what you have wrote here all the time! Most of my work outfits are pretty casual and I NEVER document them because they don't involve a pretty vintage dress, yet maybe these outfits are actually more me! I am definitely going to try to start including more casual outfits. I think that with good photography (which your blog definitely has! ), it can make even a simple outfit look amazing! P.s. Your neighborhood does look quite adorable, but I am so happy for you family's fresh start! Happy Friday! cute outfit! i like seeing pretty casual outfits on people's blogs too, since it gives me ideas for casual errand outfits. new follower from the casual friday blog hop. Your sweater is gorgeous!!!! Love it!!! That red tee with the pop of red lipstick makes me happy! I love your sweater! And the moccasins are AMAZING! Love your outfit! Thanks for linking up for Fearless Fashion Fridays. Oh I love everyday outfits… they're the best!! and I am always contemplating the who self evaluation/why I blog thing. Its kind of funny actually how often. anyway, your sweater and shoes and just your outfit is fabulous! I love it!! Thanks for linking up with Falling for Friday!! I love seeing casual outfits too! It's really interesting to see the variety of styles a person wears. You can share any outfit you want on your blog! This casual one is super cute. I love the stripes with your cool cardigan. 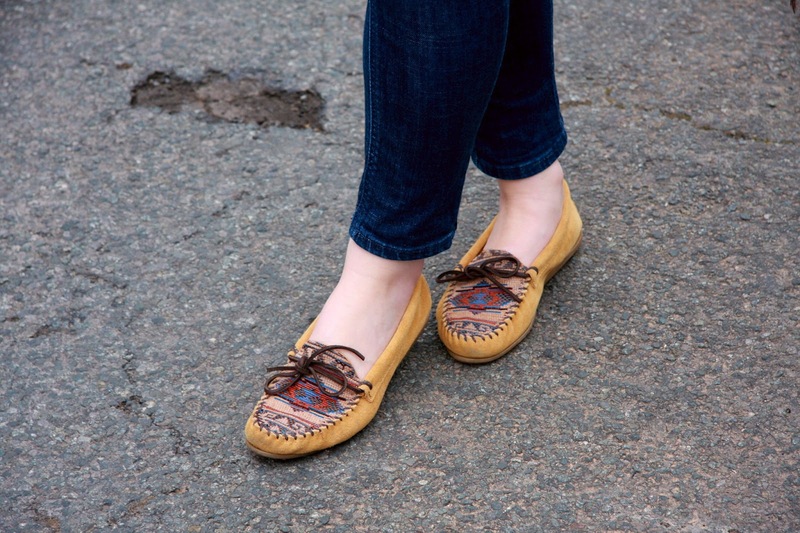 The moccasins are adorable too. Whatever you wear you look absolutely gorgeous! I try and be as honest as possible whatever I wear and do and as you say it isn't all high glamour, quite the opposite, haha! You are brave, I would not be able to wear strips and aztec patterns together! I def know what you mean but i'm glad you'll share casual outfits too, this one is so cute w/ the cozy cardi. i actually genreally find dresses more comfy than jeans but do love flats/leggings. 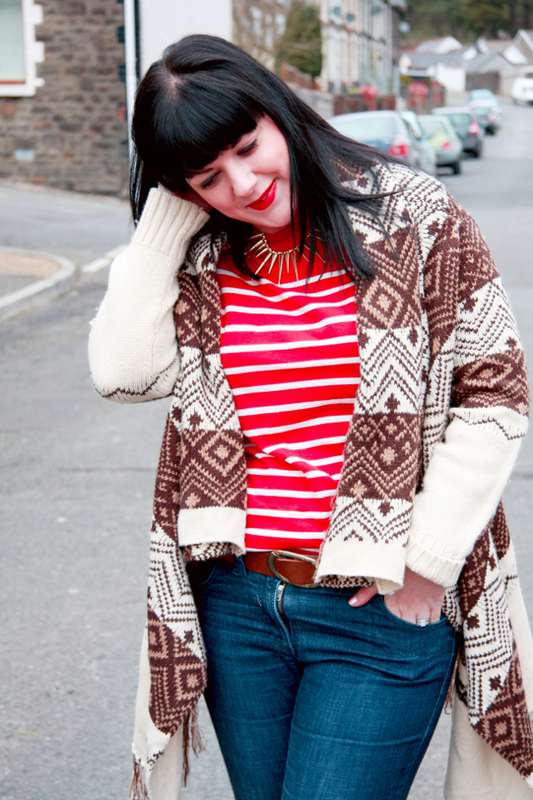 and i too have been questing the whole blogging outfits piece so i'm glad to hear i'm not alone. 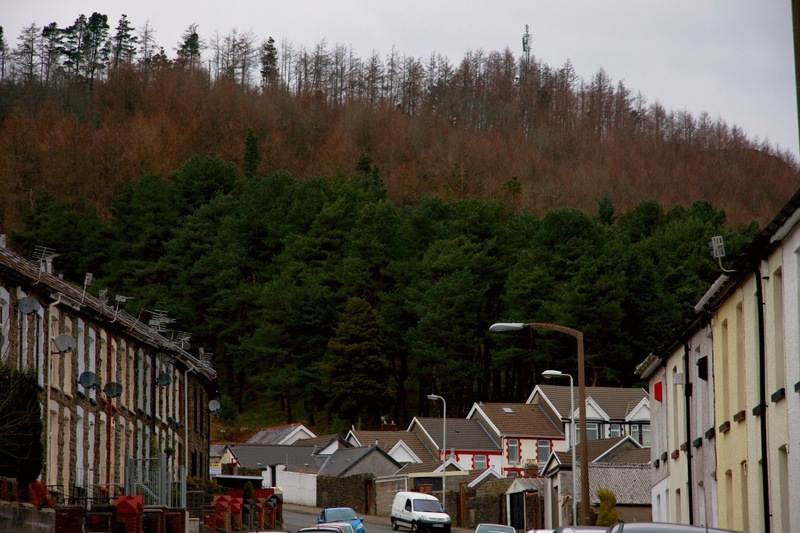 love the pic of the buildings on the hill w/ those trees- you live in such a beautiful place! hope you're enjoying your weekend w/ your family & best wishes w/ all these transitions! I try to post all kinds of outfits because I wear a lot of causal outfits they are often my favorite. I feel that way about blogging sometimes and just when I feel this way usually something gives me new life and inspiration. I absolutely love this outfit! 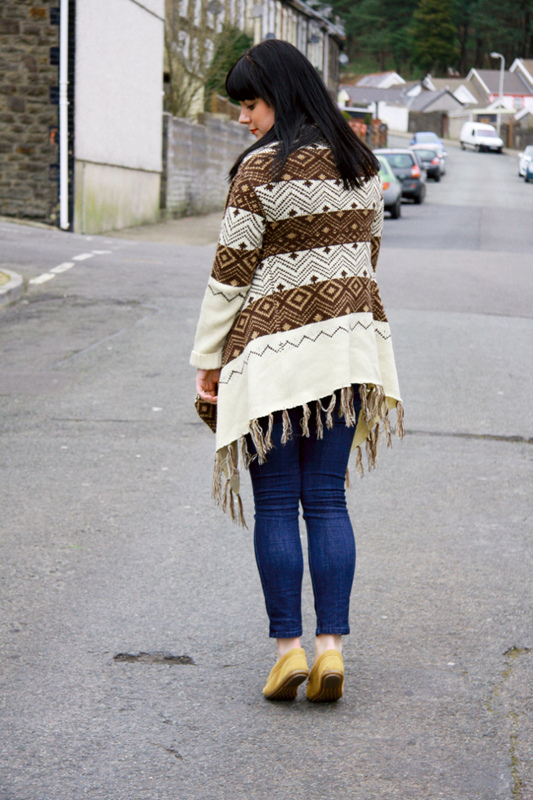 That sweater is so gorgeous, and you can never go wrong with mocs! Love the way you mixed patterns here. And those Minnetonkas! I've been wanting a pair so badly!